Candle making developed independently in many parts of the world at different times. The Romans began making dipped candles from tallow around 500BCE, although they mainly used lamps filled with olive oil. Romans often gave candles to each other as gifts during Saturnalia, a winter festival similar to Yule or Christmas. The Chinese made candles from whale fat during the Qin Dynasty (221–206BCE). In India, wax from boiling cinnamon was used for temple candles from very early times. Early Christians disapproved of candles for use in worship. They considered them heathen because they were frequently used in Pagan rites. Obviously, they got over this aversion quite quickly. In Europe, candles became the most common form of lighting during the Middle Ages. Candles then were primarily made from tallow or beeswax. Tallow is extracted from the suet of sheep and cattle. It stinks, but was cheap so was what most ordinary people used, replacing or supplementing reed-lights. Beeswax, which smells lovely but has always been expensive, was used for church candles. The Christian festivals of Candlemas, on February 2, and the feast of Saint Lucy, on December 13, became very popular. Both are candle festivals, with candles being blessed at Candlemas and St Lucy’s Day being a festival of light close to the Winter Solstice. However, there are suggestions that both of these feast days may have older, Pagan origins. In the 18th century, whale oil (spermaceti) began to be commonly used for candle making. In the mid 19th century that was superseded by paraffin wax. Stearin – purified animal fat that doesn’t smell horrible – was also developed and often added to paraffin wax to harden it. Recently, vegetable waxes including soya have become popular for making candles, although actually the first American colonists discovered that wax from bayberries could be used in chandlery. The use of candles for general lighting waned when electric lights were developed, but for mood and magic they are showing no sign of dying out. Candles became a common component for witchcraft, spellwork and divination in Europe from the Middle Ages. An 11th century treatise, Lots of the Twelve Patriarchs, described a method of predicting the future that involved fasting by the light of ‘a candle of double weight’ for two days. When Alice Kyter was accused of murdering her husband by sorcery in the 12th century, according to PG Maxwell-Stuart in The British Witch – The Biography, one of the accusations levelled against her was that she had used dead people’s nails, buttock-hairs and the clothes of children who had died before they could be baptised as ingredients in candles employed for maleficent purposes. Here...we are given an example of the kind of thing she did. She would measure a man’s height, have a wax candle made the same length, and then have it offered in front of a statue or painting (coram imagine). Once it was lit, the man would waste away just as the candle did. Any history of candle magic has to include the infamous Hand of Glory. Documents from the 18th century describe this as the pickled hand of a hanged man combined with a candle made from the corpse’s fat, which was supposed to have the power of rendering motionless those who fell within its light. 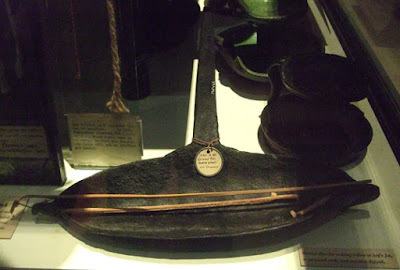 A Hand of Glory is on display in the Whitby Museum, in Yorkshire, if you feel like seeing one. The picture at the top shows a tallow candle-making pan in the Pitt Rivers Museum, in Oxford. 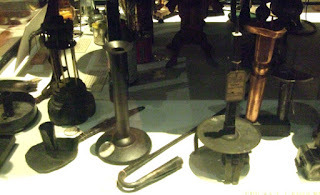 The second photo shows various types of candle holders that were used in the past, also in the Pitt Rivers museum.